Here is a complete blip.tv video of Zoning for King Street, a public forum hosted at the Bluebonnet Diner on 9/21/10 by Northampton’s Zoning Revisions Committee. This video is 2 hours 2 minutes long. The first hour is a presentation of proposed zoning changes (PDF, 2MB), including those suggested by the Chamber of Commerce (PDF, 1.3MB). The second hour is devoted to questions and comments from the public. This video was recorded by Adam Cohen. A second (and similar) public forum on King Street will take place at the Jackson Street School Gym, 120 Jackson Street, on September 29, 7-9pm. Urban planner and land-use attorney Joel Russell abruptly resigned last week from the city’s Zoning Revisions Committee (ZRC), which he chaired. “I have one request,” Russell wrote: “that the public be presented with some alternative viewpoints (not necessarily fully developed proposals) on the Chamber of Commerce’s proposal for the HB [Highway Business] district on King Street. As King Street goes under the microscope, architect Ellen Dunham-Jones talks in Atlanta about the successful reuse of empty buildings and parking lots, and enhancing the attractiveness of major thoroughfares. The Ward 3 Association board is concerned that property owners be given proper notification that a zone change is being proposed for their property. This will allow property owners the right to speak about the proposal at public meetings and express support or opposition for changes to the zoning on their parcel. These charts summarize the zoning changes the Chamber would like to see (download the charts as a high-resolution PDF). Allowing the agreement to expire would enable the city to develop a new process for deciding the future of this site. The undersigned are not opposed to developing the site but rather want to see it developed in a manner that maximizes its value to the whole community. The Pulaski Park/Round House lot lies at the very center of our city, and should become a jewel in the crown of downtown Northampton – a Center that serves our residents, visitors, arts communities, and businesses. We need to develop a workable vision for this site. A carefully designed process that generates a wide range of ideas and public buy-in will provide the groundwork for a successful project going forward. 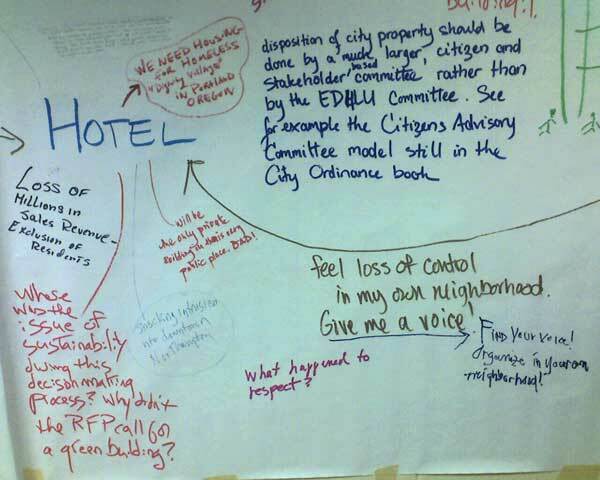 The committee members discuss the controversial decision-making process involving the downtown Hilton Garden Inn hotel.